Young girls picked them every one. Gone to young men every one. Gone for soldiers every one. (1) Pete Seeger, the famous A¬merican folk singer and com¬poser, once came across Sho¬lokhov's novel ‘ And quiet flows the Don ', where he found three lines of an old Ukrainian folk song. He was favourably impressed by those few lines and tried to find the whole original long. After a year he gave up the search and wrote words and music of this beautiful song which has become very famous especially among young people. At the beginning of the 1960s there was a great change in the pattern of American and English )ife. This change was due to the Pop Revolution which broke down social barriers among the young. It was important, especially in Britain, where inhibitions had always given the British the reputation for being cold and reserved. The young broke through their traditional reserve and were no longer afraid of showing their feelings and their thoughts. The Beatles and some American folk singers, musicians and com¬posers such as Pete Seeger, Joan Baez and Bob Dylan, helped the young to break the traditional barriers. Pete Seeger first gained fame during the 1940s singing about ordinary working people, war, and social problems, and strongly influenced Joan Baez who has always been praised for the si plicity of her vocal style. She, too, like Bob Dylan, saw thechanges in society, hated the war in Vietnam and the exploitation of black people in America and sang about these import social items. 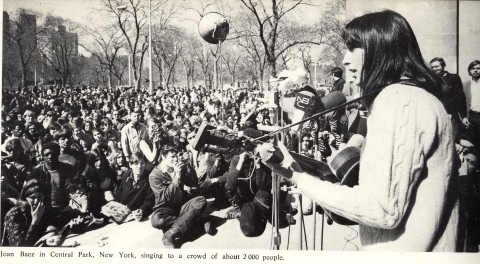 Joan Baez also took part in demonstrations agaist the Vietnam war and once was put in prison for joining a for bidden peace march.